A few years ago a weird looking lip balm was in the Blogher swag bag. I remember thinking, "This is too weird to take off." Cause who would want a lip balm that is shaped like a ball. You can't tuck that into your pocket! Well, I was super wrong. According to Ella, my 10yo daughter, a lot of the girls at school have EOS lip balm. And well, I finally tried mine and fell in love. It's not too greasy, just enough moisture. I buy another line for my super chapped lip days, but my daily lip balm is EOS mint. This is why I responded with a resounding "YES!" when I was asked if I wanted to do a review of their new line of hand lotion (that's me holding "fresh flowers"). Winter is tough on my body. My skin gets dry very easily and the fact that I adore hot showers doesn't help. I keep lotion in my office desk and in most of my bags. It's one of those items I am always on the hunt for the "perfect one." 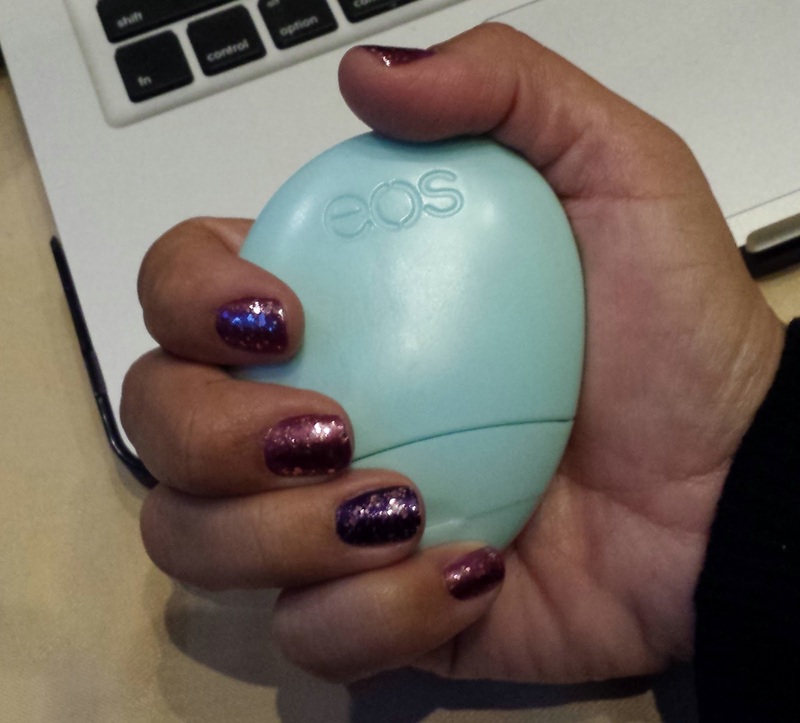 EOS hand lotion is a great product. First, the design. Opposite of its lip balm, the lotion is perfectly designed. See how it fits into my hand? Love that. It also fits into the back pocket of my jeans. JSYK, it is also the perfect size to prop up a smart phone. I carry enough stuff on a daily basis, I need my stuff to multi-task! The lotion itself is not greasy and absorbs right into my hands. It's not super thick like lotions that are for super dry hands either. But what I really liked is that I didn't feel as if I needed to go back and reapply just an hour later. EOS products are also free of animal products (except beeswax, lip balms do have that), paraben-free and gluten-free. Either project would be a great last-minute stocking stuffer! Disclaimer: I received two hand lotions for review. No further compensation was offered or accepted. I just got this in my Christmas stocking, and I already love it. Because I have never managed to finish a chap stick or lip balm before losing it, I am excited by the larger orb shape--I'm hopeful that this will be hard to lose to the netherworld made up of my washing machine, under my bed, etc.